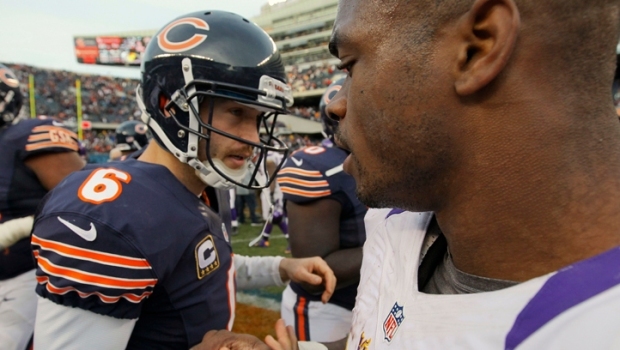 The Bears played a complete game in beating the Minnesota Vikings. But who were the biggest stars on Sunday? Adam Podlesh: In the past few weeks, the Bears tried out new punters because Podlesh had been struggling. He responded with a huge game, kicking some booming punts and helping the Bears score a two-point conversion that was completely unexpected. Brandon Marshall: On Sunday, Marshall became the first Bear since Marty Booker to reach the 1,000-yard mark. He did it with a game where he made 17 catches for 92 yards. The Bears record is 1,400 yards, held by Marcus Robinson. Marshall has five more games to break the single-season record. Gabe Carimi: This week, Gabe Carimi was benched after poor play against the 49ers. Instead of sulking, Carimi played well when he was called on to line up as a tight end and give the Bears extra blockers. Then, when the line was ravaged by injuries, Carimi raised his hand to fill in at guard -- a position he has never played. Chris Conte: The offense took center stage on Sunday, but safety Chris Conte still stood out. He picked off Christian Ponder, plus broke up two passes and had three tackles. It was a marked difference after the safeties broke down on so many plays against the 49ers. Plenty of players stood out in a good way. However, what stood out in a bad way? Body parts: As a whole, the Bears were playing well. However, their individual body parts were not holding up. Devin Hester's head, Charles Tillman's ankle, Chris Spencer and Lance Louis' knees, and Matt Forte's ankle didn't do their part. Five Bears starters left the game with injuries. Lance Briggs' ankle bothered him, as well.